Inside: Tips for planning a tech-free vacation with your kids. 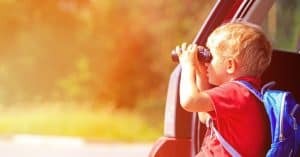 Follow these guidelines for a vacation free of phones, tablets, and complaints, regardless of your children’s ages. A ten-hour road trip with a car full of pre-teens and no electronic devices allowed. A tech-free vacation with your kids may sound daunting. But I’ve gone on a couple of them, and there’s less fighting and arguing as opposed to when we all bring our devices, even between siblings. Sound too hard to believe? Decide ahead of time which technology is allowed and when. Set the rules and be firm. For example – is it only phones that are banned or all devices? Can TV be watched? Or if you’re going on a road trip, can devices be used on the road and then you take them for the duration of the vacation, and they come back out for the ride home. I drove my preteens to Colorado for a 10-hour road trip. Devices were allowed during the car ride, but once we arrived in Colorado, they turned them into me. I also allowed TV during the evenings after full days of activities. On a completely tech-free vacation, no technology is allowed whatsoever — no phones, devices or TV. It may sound scary – but it’s doable. We hiked mountains in CO on one vacation that included a 10-hour road trip with my daughter and her friends without any technology, including TV. Believe it or not, this worked out wonderfully. Regardless of your guidelines on technology use during your vacation, use these basic rules below. If you decide on no technology at all, leave your children’s devices at home. If you let them bring the devices “just in case,” they’ll wear you down, and you’ll give in and let them have it. Think ahead of time what possible reasons they may “need” their phone and account for it beforehand. Such as communicating with the other parent, receiving updates from school or a coach, the camera, etc. Give your children plenty of warning it’ll be a tech-free vacation. You can even state, here’s where we’re going but no phones allowed, do you still want to go? From the moment you’ve established the rules, don’t or let them open up the conversation. If you’re going on a road trip, consider listening to an audiobook the whole family would enjoy. 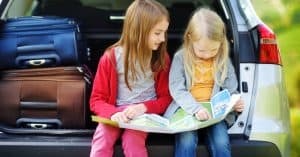 Reader’s Digest has a great list of family audiobooks for long car rides. Your kids will have a hard time keeping a positive attitude if you’re relaxing at the end of the day breezing through social media. Use your phone for maps, taking photos, and making arrangements for your trip. Make a pact with yourself to stay off social media and email for your journey as well. Sharing your pictures and vacation with Facebook can wait until you get home. 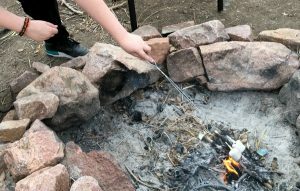 Related: Colorado Springs Vacation with Kids and Your Dog! A tech-free vacation works best if you’re away from your hotel all day from sun up to sun down and not stuck riding public transportation. A trip to the mountains with lots of hiking or skiing is perfect. Kids equate downtime with their phone. An active vacation like hiking or skiing gives your kids minimal downtime. When they come back exhausted from their day, they’re more willing to partake in family time or read. If you allow TV during your tech-free vacation, then they most likely won’t even miss their phones after active days. Provide lots of room for your kids to burn off energy and have activities available for your kids to use their imagination. Both times we went on a tech-free vacation we stayed in an Airbnb, so we had a full backyard, board games, and brought our dog for the kids to play with. On their own, they played hide n’ seek, old paper games (like M.A.S.H. or hangman), and even asked to build a campfire. When you first suggest a tech-free vacation, you’ll need to prepare for a little bit of grumbling, especially if you have older teens. However, I’ve found once you arrive at your destination and have a full day’s of activities under your belt, you see your kids becoming kids again. And it’s all worth it. 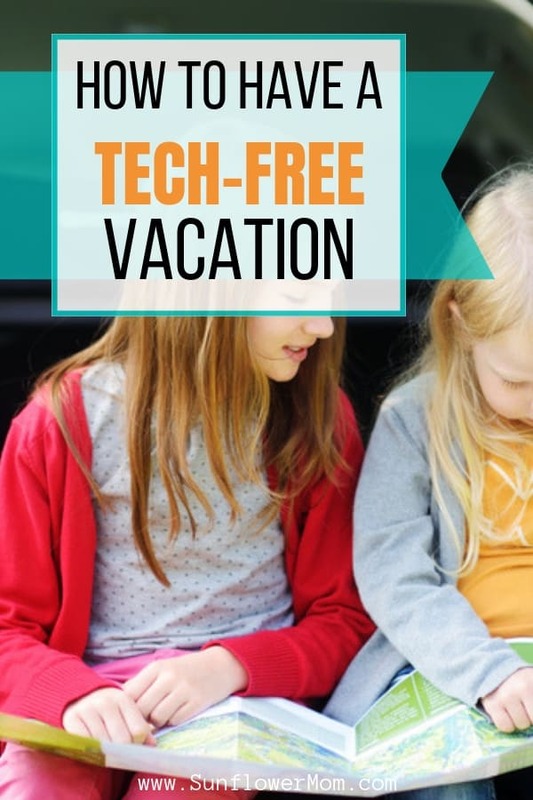 Tips for planning a tech-free vacation with your kids. Follow these guidelines for a vacation free of phones, tablets, and complaints, regardless of your children's ages.